Apple touts the iPad’s browsing chops, and the iPad’s Web experience is indeed very good from what we’ve seen so far. But the iPad’s Safari Web browser is based on the iPhone version, and as good as iPhone browsing is compared to other mobile phones, even the biggest iPhone fan will admit that it has its limitations compared to browsing on a Mac or Windows PC. Which leads to the obvious question: Is browsing on the iPad really good enough to let you forgo a laptop or netbook in favor of an iPad—or at least good enough that you could leave your laptop at home for many trips? Or is it more like browsing on the iPhone: good enough for casual, on-the-go use, but not your first choice for general browsing? After a day of iPad use, the answer is an authoritative “it depends.” For some sites, iPad browsing is an incredible experience; for others, you’ll find yourself saving URLs to visit later on your Mac. The good news is that, compared to the iPhone, the balance has shifted significantly towards the former and away from the latter. Let’s get this out of the way at the outset: Like the iPhone, the iPad’s browser doesn’t support Flash. If a particular site has Flash content and no iPhone/iPad-friendly alternative, you won’t be able to view that content on the iPad. Period. (This includes horrible Websites that are entirely Flash.) In this respect, the iPad is firmly in the iPhone column in the desktop vs. mobile debate. iPad Safari comes up blank on this bit of Flash on the BBC site. That being said, a funny thing has happened over the past year or so, and especially over the past few months: Because of the success of the iPhone and other mobile (read: Flash-unfriendly) devices, many Web sites that previously used Flash—especially sites that used Flash predominantly for video—have transitioned to formats these mobile devices could handle. YouTube, for example, started nearly three years ago to dual-encode many videos in Flash and H.264 formats, and now has a version of the site that uses Mobile Safari-friendly HTML5 and H.264. And Apple is currently showing off a list of iPad-ready sites that includes heavy hitters such as CNN, The New York Times, Vimeo, Major League Baseball, Flickr, and Sports Illustrated. Oh, and don’t forget that many sites that use Flash to stream media—including CBS, ABC, Netflix, and Hulu—are either already offering native iPad apps or are working on them. On the other hand, NBC is apparently not interested in streaming media to the iPad, and with a few exceptions for Flash games that have been converted for iPhone OS (Canabalt, anyone? ), online Flash games are out of reach. So depending on your browsing habits, the iPad’s lack of Flash support could mean missing out on your favorite online games and media, or it could just mean that you’ll no longer be annoyed by Flash Web ads. As those who’ve used Safari on an iPhone or iPod touch can attest, there’s something deeply intuitive about touchscreen browsing: tapping links and buttons with your fingertip, sliding your finger up and down the screen to scroll, pinching or tapping to zoom…it just feels so much more natural than using a mouse or a trackpad to interact indirectly with a Web page. With Safari on the iPad, you get all those touchscreen benefits, but the larger screen improves the browsing experience even more dramatically: You can see much more of every page, and when you do need to zoom in on something, you can do so without the sense of “Web blinders”—the rest of the page being completely hidden from view—you get on the iPhone. Safari iPad's portrait view of the Macworld site—it looks much like you'd see on your Mac. On the other hand, the iPad’s screen, while much larger than an iPhone’s, is still considerably smaller than what you’ll find on most laptops; it’s closer in size to the screen of a large netbook. This means that less of each Web page will be visible compared to Safari on a “real” computer, and on many sites the text will be tiny. So you’re still going to be doing more scrolling and zooming than if you were browsing on your Mac or MacBook. One major difference between Safari on the iPad and the iPhone is which version of a Web page, desktop or mobile, you see when visiting a site. While the iPhone version of Safari is usually served the mobile version of a page—one with a tighter layout, fewer images, and other design differences that make the page easier to view on a tiny screen—Safari on the iPad usually gets the full-blown desktop version of the page. In most cases, this is a good thing, as the iPad’s larger screen means you’ll want to see that full version. The exceptions would be sites where the mobile versions of pages are optimized for touchscreens, or ones where the desktop version uses Flash for video while the mobile version uses H.264 or another non-Flash format; in those cases, you’d want to view the mobile version. 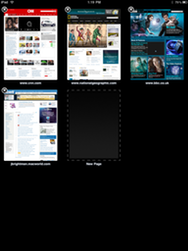 In our early testing, the iPad usually gets the full version of such sites. However, we suspect that most Web servers are not yet configured to recognize the iPad’s browser—Mozilla/5.0 (iPad; U; CPU OS 3_2 like Mac OS X; en-us) AppleWebKit/531.21.10 (KHTML, like Gecko) Version/4.0.4 Mobile/7B367 Safari/531.21.10, for the Webdevs out there—so you’re getting the desktop version of pages by default. Once servers around the ’net are updated to recognize Safari on the iPad, you may get different results on particular sites; for example, you may get a touchscreen-optimized version of a site instead of the desktop version. One of the most popular features of desktop Web browsers is tabbed browsing, which lets you open multiple Web pages within the same window, placing each within a “tab” in that window. 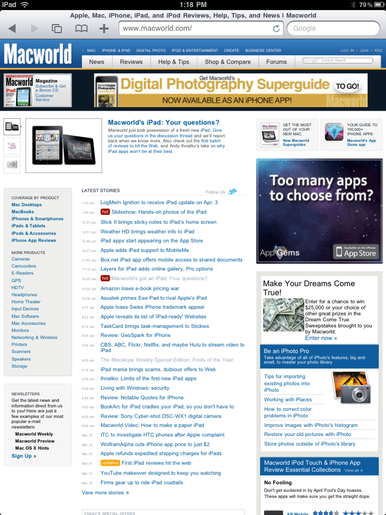 But despite the iPad's larger screen and closer-to-desktop performance, Safari on the iPad is closer to the iPhone version here: You can open up to nine Web pages simultaneously (vs. the iPhone’s eight), but only one page is visible at a time, and to switch between pages, you must press a toolbar button to enter the Pages view. But even here, there’s a nice improvement: Whereas the iPhone provides a one-page-at-a-time view for choosing a Safari page—you swipe to cycle through all your open pages—Safari on the iPad gives you an Exposé-like screen for previewing all your open pages simultaneously; tap on one to bring it forward, or tap any page’s close (x) button to close that page. On the iPad, bookmarks appear in a popover menu. One of my favorite changes to Safari on the iPad compared to the iPhone version—and a change that brings the iPad’s browser closer to its Mac counterpart—is the addition of a bookmarks bar just below the toolbar. 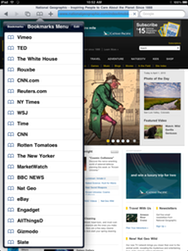 As with Safari on a Mac or Windows, you can place bookmarks or folders of bookmarks in this bar for quicker access. By default, the bookmarks bar appears whenever you tap in the URL or Search field, but a new Safari setting lets you choose to keep the bar visible all the time. If you sync your Safari bookmarks with your computer (using iTunes or MobileMe), the bookmarks bar mirrors Safari’s bookmarks bar on your Mac or Windows PC, with one minor exception: iPad Safari doesn’t support the concept of tab groups, so a tab group in desktop Safari’s toolbar is converted to a folder in Safari on the iPad. The iPad's Safari gains a bookmarks bar like its desktop sibling. We’ll have more coverage of Safari on the iPad in the coming days and weeks. I’ll also be taking a similar look at Mail on the iPad compared to its iPhone and Mac counterparts. So stay tuned.